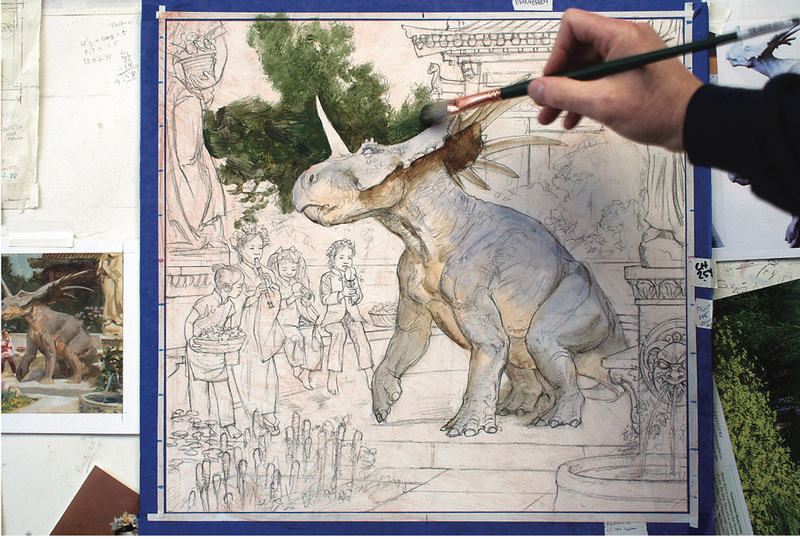 This weblog by Dinotopia creator James Gurney is for illustrators, plein-air painters, sketchers, comic artists, animators, art students, and writers. You'll find practical studio tips, insights into the making of the Dinotopia books, and first-hand reports from art schools and museums. Can I Mix Different Brands of Gouache? Should a watercolor be purely transparent? How can you draw accurately but quickly? Enjoy what you read? If you support this blog, you will feel good and the world will be a better place. Sorry, I can't give personal art advice or portfolio reviews. If you can, it's best to ask art questions in the blog comments. All images and text are copyright 2015 James Gurney and/or their respective owners. Dinotopia is a registered trademark of James Gurney. For use of text or images in traditional print media or for any commercial licensing rights, please email me for permission. However, you can quote images or text without asking permission on your educational or non-commercial blog, website, or Facebook page as long as you give me credit and provide a link back. Students and teachers can also quote images or text for their non-commercial school activity. It's also OK to do an artistic copy of my paintings as a study exercise without asking permission. How have you overcome roadblocks in your creative process to create works that meet your artistic goals? Almost every artistic project has roadblocks. Some are from the outside and hard to control, such as a requirement from your publisher, a demand from your gallery, or if you're painting outside, bad weather. Some are internal, such as doubts or bad habits or other psychological barriers you have to get beyond. The hardest roadblocks to overcome are initial creative decisions that seemed good at the time, but which turn out to be flawed thinking. I call this problem the "tyranny of first decisions." That might be as simple as choosing a vertical 36" x 24" linen canvas for your portrait, or it might be as bad as the decision to make a live-action adaptation of Popeye. The final product will be the offspring of the very first choice that you make, and nothing later will fix it. Those problems are hard to address because they're hard to recognize. The problems that issue from the first decisions aren't evident until later in the process. Until you recognize the problems and face them, you can't correct them. Sometimes getting past a roadblock means starting over entirely. Sometimes it means fixing something mid-stream. Knowing what can be changed and how it can be changed isn't easy, even for an experienced artist. You have to be honest with yourself, or ask a friend to give you feedback at various stages. Most mistakes can be fixed if you catch them in time. What is something (perhaps a habit, a learning experience, or an inspirational figure) that you feel has helped you on your road to be a successful professional artist? At an early age, I ran across a book about Norman Rockwell, where he described his process in great detail. He showed his thumbnail sketches, posed models, comprehensive drawings, and color sketches leading to the final painting. I realized that every big task can be broken down into meaningful steps, solving one problem at a time. If you approach the making of a picture or the development of an illustrated book in that way, you're almost guaranteed of a successful result. As Rockwell did, I put up in my studio a little sign that says "100%" to remind myself to make a full effort on every step and to trust the process. "…or it might be as bad as the decision to make a live-action adaptation of Popeye." I'm sure you've looked, but do you have any idea what book it was, or can you recommend a different book about Norman Rockwell's process? Roadblocks can be opportunities. You don’t always need to fight them; sometimes you accept the detour and move into unknown territory. Roll with the punches. Uniqueness and innovation often blossom from challenging circumstances. Bruce lee said, “You must be shapeless, formless, like water. When you pour water in a cup, it becomes the cup. When you pour water in a bottle, it becomes the bottle. When you pour water in a teapot, it becomes the teapot. Water can drip and it can crash. Become like water my friend.” There is strength in flexibility. When the vision is strong enough, make the commitment to stop at nothing until you realize it. Period. Personally, I enjoyed the Popeye movie....hey...Robert Altman....what can I say. This is an excellent post and you're a great teacher. I only wish you were around when I was a kid. However, it’s never too late to learn more every day. You touch down on problems we've all experienced in our work time after time. By the way. I ran across that same Rockwell book as a young artist. If I’m right, it’s the one originally published in about 1947. Two things: like very much what Tom said. Second, was your choice of Dinotopia image just to provide a visual or does it somehow connect to the question/answer? "Rockwell on Rockwell, How I Make a Picture" first published 1979 by Watson Guptil who states that the book is an expanded version of a 1940s book Rockwell wrote that was the basis for his Famous Artits School courses. A quick check on Amazon ranges the book from about $50 to $140 USD. One of the problems with asking a friend is that you have to know if what you're getting is a technical point or a point about appreciation. That is, a lot of people confuse what they like with something being good, and vice versa. Sadly some people do not know the difference. My "sounding board" will not make a comment about florals, because she doesn't like florals. I know that, and it's good. Also, she hasn't an artist's vocabulary so I have to interpret what she says. However, we wind up agreeing so often that I see a lot of value in asking. She points out much of what I suspect is there, but missed in detail. I knew something is wrong. She zeros me in on it. That's a huge help. Thanks -- great comments, all. I thought of one more aspect of this question after posting. Sometimes your initial decisions are good ones, but the painting looks terrible at first. Or it looks awkward for a long time. By fixing little problems as they come along and sticking with it, you sometimes come up with a real winner at the end of the process. Your idea was good all along, even though you were ready to toss it out many times along the way. This is another difficult thing to address because your brain is telling you to quit and start over, but the best advice is to stay the course and don't give up. Persistence is a powerful ally, and more paintings are ruined by abandoning them too early than by overworking them. Johnnyburn, Glen and Paul, both "Norman Rockwell Illustrator" and "Rockwell on Rockwell" helped me when I was starting out, and I've linked them at the end. Steve, that image illustrates the second point better. It didn't hit any major roadblocks because I went through and did all the steps of the process. Tom and Bug, yes, I think most people find a person who they trust for input, and they arrive at the timing and the style of delivery. For Pixar, it's the "Brain Trust" of other directors. GronkChicago, To be honest I haven't watched that movie all through, just saw a couple of cringeworthy clips. Jim, thanks for sharing that inspiration. I had never read it in full. James, you make another good point in you comment here on sticking with it. I had an instructor who taught sometimes when things look like a disaster it is only a matter of asking yourself "What are the fewest amount of changes I need to make to save it or make it work?" Often it is not as bad as it seems and only a few small changes will bring it back in line. I agree more paintings are ruined by abandon than overworking. Because of the way I work my watercolors always look so ugly for the first two-thirds of the process while I see other artists whose wc's look good all the way through but I have learned to stick with it. It is painful but if I abandoned them I would never finish a watercolor. I absolutely love Altman and his movie Popeye. I was sorry it was a box office flop, but to see the Island of Malta and do some research on the history was interesting. A stronghold for pirates. The color of the water is worth the movie alone. Loretta and GronkChicago, as we all know, our personal tastes can't be argued, so may I suggest we revise the principle to say that the final result, whether we judge it to be good or bad, is necessarily bound by the first decisions.